cervical, thoracic, & lumbar spine. The first robotic spine surgery center in San Antonio. We implement the Mazor Robotic Renaissance for unrivaled precision. The Alamo Neurosurgical Institute focuses on back pain treatment through a variety of options. We are capable of treating the full spectrum of neurosurgical disorders, with a special focus on spine surgery. We practice the most advanced and effective neurosurgery in San Antonio and the surrounding areas. We are credentialed at all of the major hospital systems in San Antonio and meet patients’ needs in every neurosurgical discipline. The first Robotic Spine Surgery Center in the San Antonio Area—implementing the Mazor Robotics’ Renaissance spine surgery system. To verify certification, click here. We accept most major insurance and managed care plans. As well, individual payment options can be arranged when needed. Our fully-trained staff can help with any questions about procedures and ensure that you can make the most informed decisions possible. 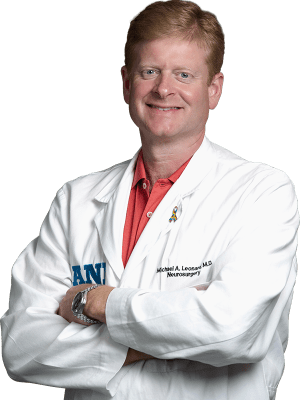 Dr. Michael A. Leonard, Executive Director of the Alamo Neurosurgical Institute, is a board-certified neurosurgeon educated and trained at New York University School of Medicine. ...he immediately was friendly and professional and explained every single thing that I was going to be experiencing in surgery."